I finally got around to watching this based on the response from The Simpsons using a recent episode. We have an FPP about that. It was enlightening, though not too surprising, to hear from so many South Asian comics and actors I like that they found Apu to be problematic. 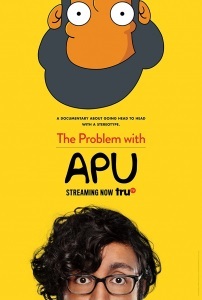 The documentary itself felt too pointed at times, that just when we were getting pulled into a larger conversation about representation and race, he would circle back about how much of a problem he had with only Apu. However, I think that's my disposition of wanting things to snowball and be more philosophical whenever there's a discussion about race. The focus on Apu probably made it easier to talk to his guests. - When Aasif Mandvi said "This is the insidiousness of racism. The person who is subjected to it is buying into it as sort of a cultural norm. Like, 'It's not a problem. It's fine. What's the big deal? You're overreacting.'" This is what you see now on twitter, with even South Asians saying "i didn't find it offensive, it's funny". - Hank Azaria turning down being in the documentary because he didn't want to be "throwing myself upon the mercy of your edit". That he has that privilege in how he wants to be portrayed. I just discovered that this is available for FREE on-demand from TruTV through their website, or (for lazy couch viewing) through the SlingTV app if you're a subscriber. Whoops, I thought I put that link in my post, but I might have deleted while editing. Thanks Strange Interlude! I think it was mentioned in the linked FPP, but figured it would be good to have here too! I cashed in an offer for a couple of free months of Sling so I could watch the new seasons of Legion and Atlanta, and I'm dead set on maximizing its utility. Haven't watched yet, but I listened to a bunch of Hari's podcast appearances promoting the film when it was on the festival circuit and I'm very interested.